There is an old saying, "where there are livestock, there are 'deadstock'." 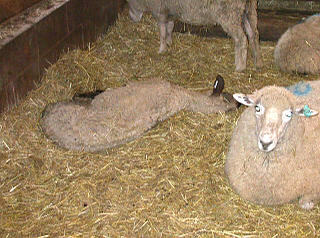 Death is a normal part of any animal production enterprise. 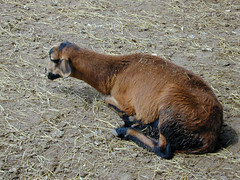 Dead animals and other wastes (afterbirth and slaughter wastes) can be a risk to biosecurity and hazardous to the environment. They need to be disposed of in a proper manner to minimize soil and water contamination and the risk of spreading disease and attracting wildlife. Laws pertaining to the disposal of animal mortality vary by location and species. Be sure to follow the laws of your county, province, and/or state. Depending upon location, disposal options may include incinerating, landfills, burial, rendering, and composting. Incinerating dead animals is an option, but may not be economical feasible, except in very large operations. Some state diagnostic labs and veterinary offices may incinerate dead animals for a fee. Incinerating is energy-intensive and has the potential for polluting the environment if the incinerator is not operated and maintained properly. However, the ashes from properly incinerated dead animals are harmless and do not attract rats, mice, or insects. 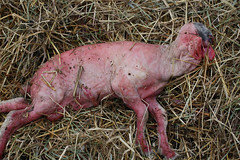 In some locations, dead animals can be placed in sanitary landfills. Before taking dead animals to a landfill, producers must check to see if the landfill will accept dead animals. Even if a landfill is permitted to take dead animals, it may not be the policy of the landfill operator to accept dead animals. Burial is still a common method of dead animal disposal, but it is becoming less preferred due to the potential for water pollution. However, it may be the only practical option for some producers. Burial involves digging a grave or pit, filling it with the dead animal, and covering it with soil. In time, the dead animals will decay. In cold climates, burial is difficult when the ground is frozen. Areas that have permeable soils, fractured bedrock, and a seasonable water table must be avoided. The burial site must be located away (at least 300 feet) from water sources and structures and neighbors. It needs to be protected from scavengers. Not all counties and states allow burial of dead animals. Rendering usually recycles the nutrients contained in dead animals into an ingredient for animal food, especially for pets. However, lack of rendering plants and animal disease concerns make it difficult to use this option. In 1989, the rendering industry in the U.S. and Canada began excluding sheep (1 year or older) from entering the rendering system. 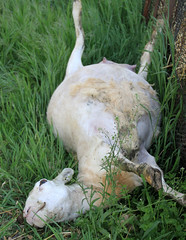 This action was the result of the unsubstantiated claim by the British government that rendered sheep carcasses (infected with scrapie) were the cause of the mad cow disease outbreak. Nowadays, it is even getting more difficult to have dead cows rendered, due to mad cow disease concerns. 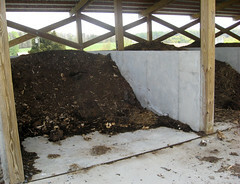 Composting is rapidly becoming the preferred method of dead stock disposal. Composting is an aerobic biodegradation process used to decompose organic material. 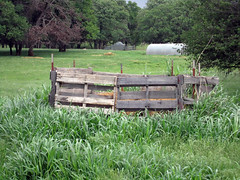 It transforms a waste product, such as manure and animal carcasses, into a useful soil amendment. Most compost is spread on agricultural land. Composting works well because it releases nutrients slowly during the warm, moist solid conditions that encourage plant growth. The compost N, P, and K should be considered part of the nutrient management plan for the field. 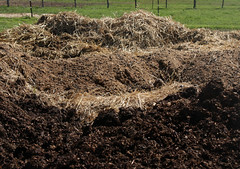 The compost generated from the decomposition of animal carcasses should not be given or sold as compost for use off-farm. To make composting work, you need to create and maintain the ideal environment for the microorganisms to function in your pile. There are four essential elements for successful composting: 1) carbon and nitrogen; 2) oxygen; 3) moisture; and 4) temperature. The carbon to nitrogen ratio (C:N) is very important to the composting process. To facilitate the composting process, you will need to add a substrate that is high in carbon to balance the high levels of nitrogen contained in the mortalities. Too low a C:N ratio may cause odors. Too high a C:N ratio may limit microbial activity, resulting in lowered temperatures and slowed decomposition. A C:N ratio ranging from 25:1 to 35:1 is ideal. Clean sawdust has proven to the best substrate for composting animal mortalities. However, other materials with high carbon content can be used, such as straw, corn stalks, corn silage, wood chips, straw-manure mixture, or old feedstuffs. Oxygen must be present in the pile to support necessary microbial activity. An adequate moisture level is also needed to ensure proper microbial activity in the compost pile. The ideal moisture content is 45 percent, but levels from 40 to 60 are acceptable. Low moisture levels can reduce microbial activity while high moisture levels inhibit the flow of oxygen and can lead to odors. Heat is the result of the composting process and is necessary for composting to work. The more heat there is, the more heat is produced, and the faster the composting process. For proper composting, the temperature must reach at least 131° F (55° C) and remain there for several days or weeks. Temperatures above 131°F for 72 hours are necessary to destroy human pathogens and most plant pathogens. Extremely high temperatures are detrimental to the composting procedure. 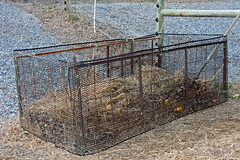 The practices of composting animal mortality are simple. You start by constructing a base of sawdust or acceptable amendment at least one foot thick. This base will collect fluids that are released during carcass decomposition. Next, place the carcass on the sawdust base. Cover the carcass with 1 to 2 feet of damp amendment. This cover acts as a biofilter for odor control around the pile and insulates the pile to retain heat. When a new carcass is added to the pile, hollow out a hole in the amendment, while maintaining 4 to 6 inches of amendment over the carcass already in the pile. Place another carcass on the pile. Cover the carcass with 1 to 2 feet of amendment. 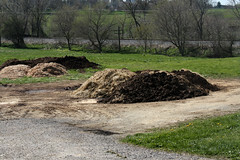 Adequate depth of materials on top of the carcass should minimize odors and the risk of scavengers disturbing the pile. To decrease composting time and to allow the carcass to be laid flat, the body cavity of the animal can be opened. 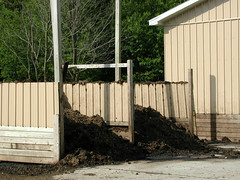 Facility site is important to successful composting. A site must be selected so that surface and ground water sources will not be adversely affected. It is beneficial to locate the facility away from neighbors and human dwellings. The facility should be away from the production unit to lessen the risk of disease transmission by rodents. The composting pad should be firm but does not need to be paved. A roof may or may not be necessary. A tarp can be used to cover the pile during periods of excessive rainfall. Usually only one bid is needed for a small flock of sheep. Late updated 01-Jun-2012 by Susan Schoenian.